A div will grow to fit the content if the height is not set in styles. 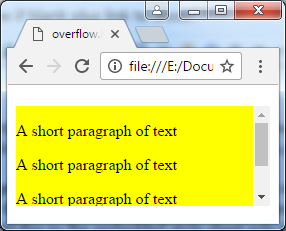 Create a new page called overflow.html. Delete the link element so there are no styles. In the embedded style sheet make the background colour for all div elements yellow. In the HTML put a div with a single short paragraph inside it. Save and view. If you ever need a horizontal scroll bar use overflow-x:scroll;.